A Collection of Fiery Wisdom on Business and Life Teachings from the Dragon Let the dragon enlighten your way in 2014 with this collection of fiery blogs created especially for YOU by brand consultant and business coaching expert Monica Magnetti. This free internet branding ebook is your guide to navigating your business and personal life with passion. 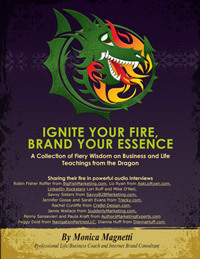 Sharing their fire in powerful audio interviews Robin Fisher Roffer, Liz Ryan, Dianna Huff, Lori Ruff and Mike O’Neil, Savvy Sisters, Jennifer Gosse and Sarah Evans, Rachel Cunliffe, Jamie Wallace, Penny Sansevieri and Paula Kraft, Peggy Dold.